No, it’s not some snazzy title for a work in progress fantasy/sci-fi novel (although I can almost see the cover image now!) this is a serious blog post. A very serious post indeed. Usually, I reserve my SM0D&L blog for promoting indie authors and their works, as well as some light-hearted banter and seasonal posts, but today, the darkness really is taking over. Given that a lot of my subscribers and readers are indie authors, I thought it was the best place to post my new non-fiction horror story. Let me start by saying this: Amazon have, so far, been very good to us. OK, so their algorithms remain a complete mystery and it is clear that they are heavily influenced by trad publishers BUT, it is fair to say that up until a few weeks ago, we had shared a mutually beneficial, if not somewhat distant, relationship. It is also fair to say that the mighty ‘Zon have made a great deal of money out of us. 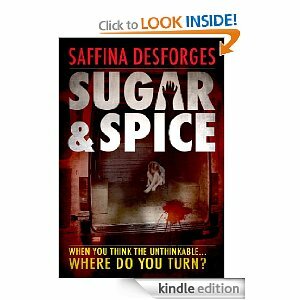 Out of the 100,000 plus sales we have now amassed for our debut crime thriller ‘Sugar & Spice’, over 95% of them have gone through the Amazon coffers, most at a 65-35 split in their favour. We have also now sold in excess 10,000 copies of ‘Snow White‘ via them too. Two weeks ago tomorrow, our book disappeared. OK, that’s not strictly accurate (hey, I’m a writer) the LINK to our best-seller disappeared from the Amazon.co.uk site. The book was still showing as ‘live’ in KDP, but if you tried to click on the cover (if you could find it) Amazon displayed a ‘404 page not found’ error message. Fourteen days later, this is still the case. Now, I am no I.T. genius, but in my limited knowledge of all things technical, that is a simple page link problem right? So how come it has taken a fortnight (and counting) to fix it? Annnnnnd, if we had uploaded via a huge publishing house, would it have taken that long? Methinks not. I’m extremely sorry for the delay this issue has caused. One of my colleagues is currently working with the appropriate department regarding this. She’ll be in touch shortly with an answer for you. Thanks for your patience. Extremely sorry?? What? Like ‘over two weeks worth of £1.49 at 70% worth of sales and a rank drop that would rival the plunge on the Nemesis ride at Alton Towers’ sorry? No, I’m sorry. It’s not good enough. As most of you know, we have recently launched our digital imprint MWiDP and have started uploading books on behalf of other authors via KDP. We now have over 65 titles live. What if this had happened to us when Sugar & Spice was at number two in the Amazon UK Paid 100 chart and was selling almost 1,000 copies a day???? What if one of our MWiDP authors has huge success and is in a great position and the same occurs? What if the link to one of Stephen King or Lee Childs books broke? What if we checked the Ts & Cs of the KDP contract and found that we might have a case against them for lost earnings? What if we had been relatively unknown authors and this was our first experience with publishing via Amazon? What if it happened to more than one book? What if a first time reader clicked on the link, couldn’t download your book and decided never to bother with your books again? What if it ruined your chances of a career being a successful writer? The list is endless and no doubt all questions will remain unanswered by Amazon, but it has certainly scared the beejeebies out of us. There is an interesting guest post on Joe Konrath’s blog by Stephen Leather that highlights the power of Amazon and what it can do for you, but what about what it can do TO you? This error could have ended our writing career before it started. Fortunately, it will end up being more of a minor disruption then the end of our dreams, but it is still very worrying. Without the might of a traditional and powerful publishing house behind us lowly indie authors, we can’t compete. Now don’t get me wrong, like I said, uploading our books to Amazon has changed our lives and will probably end up being the spring board to fulfilling our writing aspirations and they have revolutionised the way we read and the publishing industry as we knew it, but writer beware, things can go wrong! Mark mentions on his blog how Amazon’s reign at the top might be coming to an end and it has certainly given us food for thought when it comes to the future of our companies and where and how we choose to publish in the future. I am hoping that our issue is resolved very soon as we get into the run-up to what should be a bumper festive period and beyond, but I am afraid to say, my love affair with ‘Zon and all things Amazon is slowly losing it’s simplistic sparkle. We shall keep you posted on any further developments. UPDATE: Latest email received from KDP yesterday = still no sign of the book! I understand your concern, and I apologize for the trouble you’ve been having. This issue had already been raised to our tech team for research, and they’re currently working on a fix. They have identified that the issue is with a search attribute associated with your Kindle title. I have now notified them to have this worked upon on top priority, and get it fixed ASAP. We should have this resolved very soon. I will also have one of my team members check on the status of the issue constantly, and get back to you as soon as the issue is resolved. Again, I’m very sorry for any inconvenience caused due to this delay. An update: 29/11/2011 09:45 – we awoke this morning to find that Sugar & Spice has returned to Amazon UK! 19 days in total. If and when we receive an explanation from KDP, I will update this blog post. Thank you so much for your patience with the title “Sugar and Spice”. The title is now searchable on all market places. I have provided links for you to have a look at. Thank you for using Amazon KDP!